Lisa is one of the most creative individuals that I know. The first thing one sees when visiting her home are the walls cheerfully adorned with many of her own framed watercolor paintings. She has an artist’s love for beauty and creativity, and is an inspiration to me with her rich cache of ideas. What fun to plan and create from all the ideas she has! Together, we have explored making miniatures from polymer clay, cooking and baking, beaded jewelry making, and crochet, and we continue to create and learn from each other. She is also a very generous person who especially loves to make gifts for her family members. 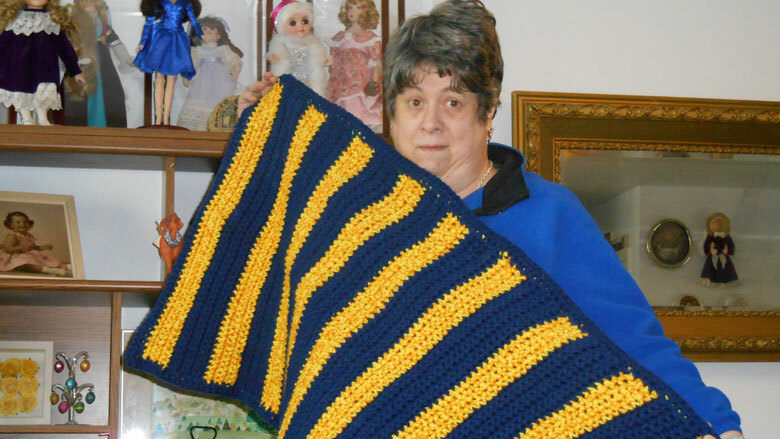 Pictured is Lisa holding one of the pet mats that she crocheted for her sister’s fur-baby.